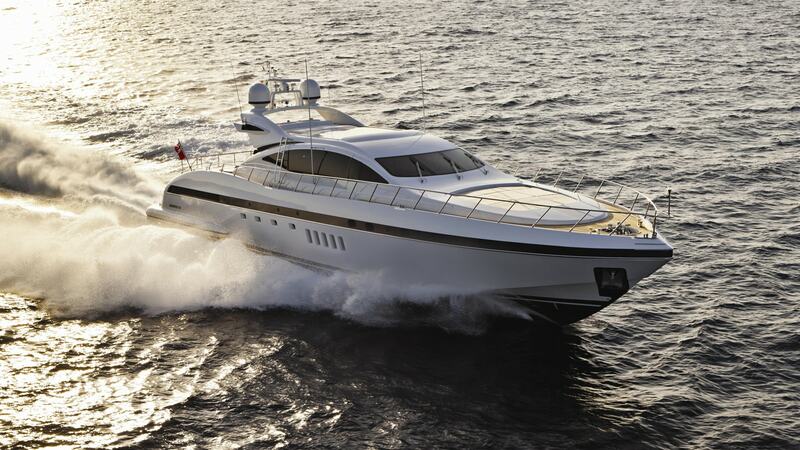 Kawai is a 28.30m (92′) Mangusta Overmarine Italian open style performance yacht launched in 2010 and impeccably maintained year on year. Known for her speed, comfort and sea worthiness, she is a perfect example of Italian yacht building with its fashion and style along with the latest construction techniques. She is recognized around the world not only for her fine luxury lines, which abound throughout the yacht but also as a high performance sports yacht. With a maximum speed of up to 40 knots and a cruising speed of 30 knots M/Y Kawai brings performance and speed to her sleek and streamlined looks. Primarily based in Sardinia throughout the summer months, she is the perfect yacht to experience the jetset lifestyle of Porto Cervo, discover the area’s beautiful coves and explore the bays along the coast of Corsica and Sardinia. Kawai can accommodate seven charter guests in a Master Stateroom, a VIP Stateroom and a twin cabin with all staterooms being ensuite. The full width Master Stateroom has a King size double bed and two his & hers ensuite bathrooms. Connected to the Master Stateroom is a cabin to relax, which includes an office that also has with TV, DVD player and hi-fi system with iPod. The VIP Cabin forward features a Queen size double bed with an ensuite bathroom and the twin Cabin features two single beds and a pullman berth. All cabins have state of the art entertainment systems that include an LCD TV, DVD player, satellite connection (SKY) and a hi-fi system with an iPod docking station. The yacht has a comfortable salon, and her winning point is a roof that opens up. She also has comfortable outdoor seating spaces, a swim platform and a nice selection of watertoys.